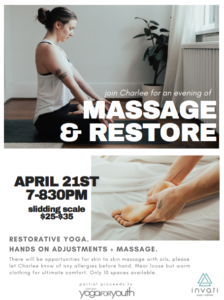 Spend your Sunday evening relaxing into some restorative yoga postures while receiving gentle hands on adjustments in the form of massage. This is a 90 min practice of long but very supported postures which encourage your body to slow down and receive its inner wisdom. Please wear loose but warm layers and let Charlee know of any allergies before hand. This a small class size with only 10 spots available so that each individual gets lots of hands on time. The pricing of this class is based on a sliding scale of $25-$35 with partial proceeds going to the non-profit organization Vinyasa Yoga for Youth. Payment will be accepted in studio.